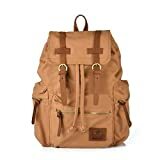 What are the best rucksack backpacks for girls? Rucksack backpacks are really cool, especially if you want to make a statement that screams class. Most rucksacks are designed with rustic, vintage applique or ornamented with leather flaps, for a classier feel. Girls who own these rucksack backpacks want to be separated from the rest as it instantly makes them unique. Which of these rucksack backpacks for girls should you pick? UNISEX. Think all the backpacks on the market are made only for women? Well not this one. Khaki tan designer-grade canvas material with understated PU leather straps, trims and pocket slings. Functional front pocket, two side pockets with metal zippers. Double padded canvas covered double slings for easy and convenient portability and carriage. This rucksack is made of 100% cotton canvas, a great addition if you are living an eco-friendly casual lifestyle. It is comfortable and at the same time, durable and fashionable. This will turn heads because of its rustic design that comes in three colors: Army Green, Black, Brown, and Khaki. Depending on the girl’s style, she will love black and green if she’s on the adventurous side, and brown and khaki if she’s the laidback type. PROS: The interiors are very roomy; you’ll be able to fit in a few books and binders, as well as some electronics (depending on the size of your laptop, it may not fit). It should fit a 13-inch laptop, a tablet, phones, a few pieces of books, and spare clothing. This doubles not only as a schoolbag but it is also your perfect choice if you like going to weekend getaways with your friends. On the inside, it has a cellphone pocket, interior zipper pocket for some IDs, cash, and cards, and an iPad sleeve. There are three zip pockets on the exterior of the bag for your smaller items such as pens and clips, keys, coins, etc. The shoulder straps are padded and adjustable to make carrying more comfortable. CONS: The leather straps in front may look dilapidated over time, but to some people, this may be a pro rather than a con because it enhances the overall rustic design of the bag. Apart from that, this bag doesn’t really have any downsides because the stitches and the seams are very well made that it doesn’t look like it would fall apart even after years of heavy use. This bag is very roomy. If you’re on the lookout for a rucksack that fits more than just books and your laptop, then this is it. For females with smaller frames though, it may not look good because the size might be overwhelming. It is 20” high and 10” wide with a shoulder strap length of 35”. The tall design is inspired by classic mountaineering style, so if you’re looking for one that is good for camps and out of towns, then this is it. PROS: The material is coated so it is moderately water resistant. It is made of durable polyester that is sturdy and comfortable when used. The flaps in front are secured by two durable straps and fastened by magnets. To fully protect your items inside, you’ll find underneath the magnetic flaps a drawstring hidden away at the mouth of the bag so none of your belongings would slip outside. Inside the bag is spacious; you’ll be able to fit a lot of books and notebooks as well as electronic devices. It comes with a laptop pouch that can effectively hold a 15” laptop and tablet. It comes in different colors, mostly plains. But there are ones with prints such as zebra and camouflage. Overall, it’s a gorgeous bag that performs, as it should. It could definitely hold a lot of weight too, as the straps are thick and durable. 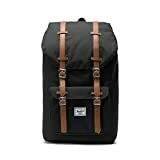 CONS: Girls who are looking for patterned eye-catching rucksack might not be happy with the Herschel Little America, as most colors are plain and some may consider it dull. Although some come with prints, it’s not that fascinating either, although some are quite cute, like the “Duck Camo”. The flaps, made of full grain leather, don’t feel like genuine leather to touch. Upside is that it’s very comfortable as the pads on the back and on the straps help even out the weight. The bag compartment for the IPAD tablet computer, can accommodate 14 inch notebook computer, the main bag is a large space, can put books, magazines etc. 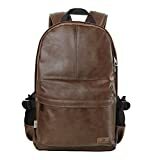 This high quality rucksack backpack is made of canvas and cow leather. Those who are looking for a classy rucksack may end their search with this. It comes in four colors so girls can choose according to their personality: Blue, Coffee, Green, and Magenta. Owners are pleasantly surprised with the level of craftsmanship of this product; it is tailored for heavy-duty use so you can rest assured that no seams would rip that easily. PROS: Authentic cow leather is used for the flaps in the main compartment and outer compartment. These flaps are held by magnetic snap closures that are made of sturdy materials. Inside, it has a lot of pockets for your belongings. Compared to the photo, which makes the rucksack look small, this backpack is very roomy and can fit most laptop sizes and other school stuff such as books, binders, etc. The outside compartment can fit smaller items such as your phone, MP3 player, pens, keys, coins, clips, etc. This is great if you need to get something fast, as you don’t need to fish it inside your bag. The canvas also looks and feels durable, and is coated to make it more waterproof. There is also a zipped compartment at the back where you can place important items like IDs, cash, and bank cards. CONS: Only complaint for this rucksack is the lack of support and padding where needed such as in the shoulder straps and back. The straps also look thin so carrying laptop, books, and other heavy items may be uncomfortable because of the straps. Good thing, the stitches look durable so you don’t have to worry about it getting loose. The efficient rucksack backpack must not only solely focus on the design but also to function and comfort as well. Pick ones that have provision for laptop sleeve if you intend to bring your computer with you all the time. At the same time, make sure to find something that has pads on the shoulder straps at the back to give you more support, if you’re carrying a lot of weight.